The National Weather Service has issued a Winter Weather Advisory from 6 AM Friday Morning to 2 AM Saturday. With Spring arriving tomorrow, Long Islanders were hoping for soon to be sunshine and warm weather. Instead, Winter has made a bit of a comeback and will be sticking around for a few more days. The National Weather Service has issued a Winter Weather Advisory beginning 6:00 AM Friday Morning to 2:00 AM Saturday. Snow accumulation of 2-4 inches is expected with locally higher amounts. It is said to begin early Friday morning, making workers commutes hazardous due to reduced visibilities and snow covered roads. This will continue through to Friday evening. The Winter Weather Advisory means that there will be periods of snow, sleet or freezing rain. If traveling, be extra cautious due to slippery roads and limited visibility. Although no School Closings or Delays have been announced yet, be sure to check our Long Island School Closures Page for the latest updates on your local district closings. 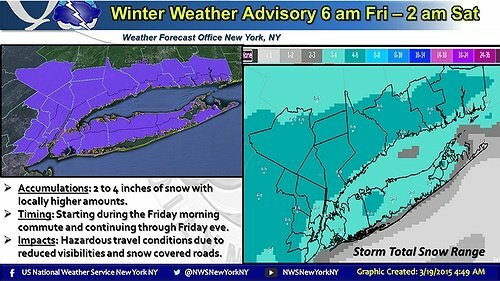 Subject: LongIsland.com - Your Name sent you Article details of "Winter Weather Advisory Issued from 6 AM Friday Morning to 2 AM Saturday"